I also share the same "getting home" feeling regarding Thinkpad's (strange coincidence!). But - last yeat (Sep. 07 to be precise) I bought a new real Thinkpad (not Levono) T41 for private use (writing documents) - and did not add the 3 year guarantee. Sadly, exactly 13 months after the purchase it died. It's a mother board thing, and fixing it will cost like buying a new one. This was quite a disappointment. Here's a suggestion: I just ran a "T41 mother board" search on eBay - average price is around $100. Maybe it's worth getting it there (if you're comfortable with installing it), or just get another used T41. Can't you flip their functionlity using the same trick you disabled the Caps Lock key? That registry trick relies on changing scancodes (the code the OS get whenever you click a key). Sadly, the Fn key does not have any scancode - all it does is change the scancode of the key pressed with it. But Clicking Fn alone is not even registered by the OS, thus swapping it is impossible. 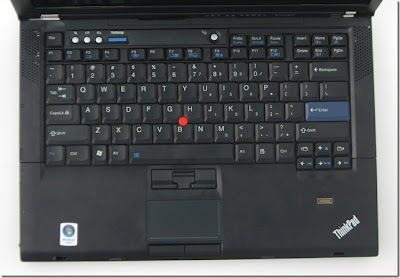 IBM (and later Lenovo) provide a key management tool that allows you to swap keys easily on the keyboard (i.e., Shift for Alt etc. ), but even that app does not allow changing Fn. 1. pull out the Fn key. You'd still be able to use the plastic underneath it for the few times you need Fn, but your finger won't mistake it for key, thus Ctrl turns to be the leftmost key. 2. Map Caps Lock (which we're not using anymore :)) to be Ctrl, and stop using the bottom line of keys.